Boys are conspicuous by their absence in basic music education. This phenomenon is not uniquely Finnish; it has been a source of concern for music education scholars internationally for quite some time. While music playschools have an equal number of girls and boys, in instrumental studies the gender balance tilts alarmingly, fewer than one third of students being boys. 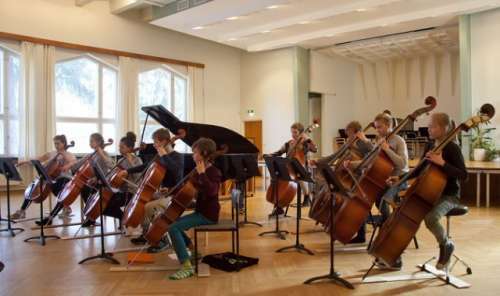 The ArtsEqual research initiative coordinated by the Sibelius Academy of the University of the Arts Helsinki involves, among other things, studying how social and cultural mechanisms govern the musical learning paths of children and adolescents. 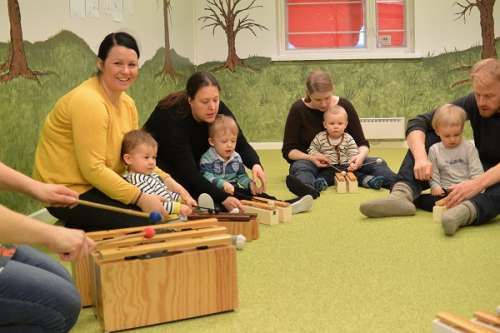 “It’s something of a mystery where all the boys go after music playschool,” says Anna Kuoppamäki D.Mus., a scholar at the UAH. Small boys and their parents attending music playschool. Photo: Katri Kaunisto / East Helsinki Music Institute. In her dissertation, published in 2015, Kuoppamäki explored social interaction among children in group music tuition and discovered that there were numerous gender divisions apparent in classroom situations. Kuoppamäki sees an interesting paradox in music. Music is firmly associated with emotions and hence with femininity. Some scholars consider that this alone is enough to make music “girls’ stuff” in the context of school. Anna Kuoppamäki notes that normative conceptions of gender continue to guide girls and boys to different after-school activities. Parents play a crucial role in challenging these cultural norms. In music education, boys are commonly sent to a band-based music playschool if there is one and select the guitar or the drums, while girls favour the piano, flute and voice. Friends are also important for the success or failure of a hobby: children’s conceptions of what is possible and where their limits lie are the cumulative product of everyday interaction. “Gender is constantly being shaped in interaction with other people. What this means is that we can explore and play around with our feminine and masculine aspects. What would be important would be to support the shaping of a social space where children and adolescents can build their own identity without gender-bound preconceptions. Adults are very important in this,” says Kuoppamäki. Cello and double bass group. Photo: Anu Saikko / East Helsinki Music Institute. Although the majority of students in basic music education are girls, the gender division gets somewhat levelled by the time of moving to vocational studies. Kuoppamäki notes that inner motivation may be a key to this. The boys who pursue an arts-related hobby despite it not being the mainstream thing to do have had to justify their choices since they were young. “As a result, their motivation for long-term, goal-orientated work may be higher, and they are more likely to stick with their hobby up to and including making an occupation out of it, having begun at an early age to swim against the current, so to speak,” says Kuoppamäki. By contrast, the recent survey run by the Finnish national board of education on Finnish school children suggests that girls show more interest in a wider range of hobbies than boys do, which can mean lower commitment and less time dedicated to any of them. This may be connected to girls having more leeway socially to experiment with their identity; a sensitive boy engaged in in the arts may even be seen by his friends as a threat to the hegemony of macho culture. “And then there are the children and adolescents who do not identify with traditional genders at all and are in danger of being excluded from the debate altogether,” Kuoppamäki points out. Kuoppamäki hopes that, instead of following convention, children might be given the opportunity to be what they want to be and have any hobby they like. Alongside parents, teachers can act as change-makers, for example, by offering the same musical activities to everyone regardless of their gender and by contesting gender stereotypes when they appear. The ArtsEqual research initiative (funded under the Equality in Society programme of the Strategic Research Committee of the Academy of Finland and coordinated by the Sibelius Academy of the University of the Arts Helsinki) is exploring how art can promote equality and well-being, and how it might be cast as a basic service accessible to everyone (project number 293199). Heidi Horila is a Turku-based freelance journalist and critic who operates in the middle ground between art and culture. Main Photo: Minna Maria Pesonen.